I popped open my Sega MS Power Base only to be let down. No sn76489 or Yamaha YM2413 for that matter, WTF? As it turns out there is a Sega 315-5124 chip which is a TMS9928 VDP ( a video sub processor ) combined with a SN76489 sound chip. Interesting, but where is the Yamaha YM2413 for FM synthesis? Well I guess it was an optional chipset on Japanese systems that allowed for 9 channels, 15+1 instruments, hardware vibrato and amplitude modulation. The board have traces for the chip marked. Damnit. Sorry to lead every one astray with the previous post about the Yamaha Chip, however this should set the record strait. One good thing that did come out of this is that I have a console that is naked sitting on my workbench. I think I may do a quick video bending tutorial with it. 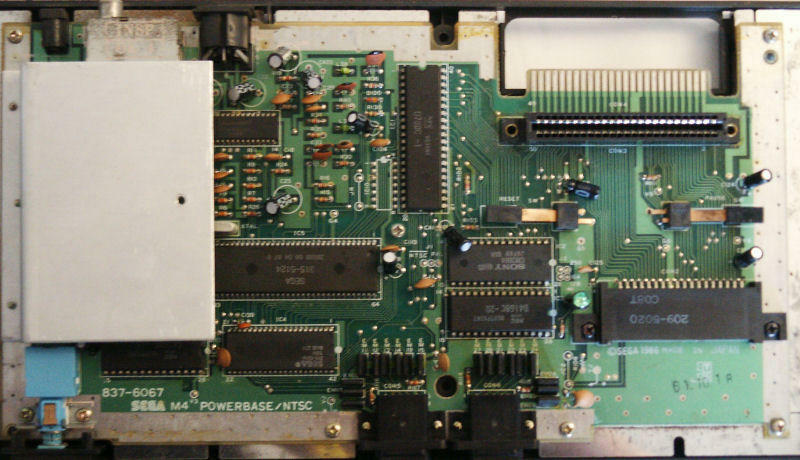 For more chip info on Sega Master System visit this link.